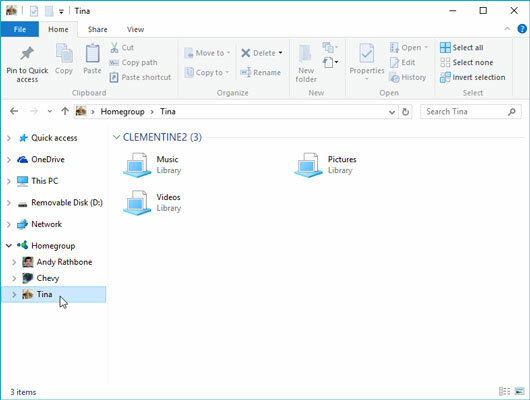 To see the shared folders of other people on your Windows 10 PC and Homegroup network, click the File Explorer icon (shown here), found on the taskbar that runs along the bottom of every screen. When File Explorer appears, click the word Homegroup, found in the Navigation Pane along File Explorer’s left edge. The right side of the window, shown here, promptly lists the names and icons of every account holder on your PC who has chosen to share files. Click the word Homegroup to see any account holders who’ve shared their folders. You may also spot names of account holders on networked Windows PCs — PCs connected to your own PC either wirelessly or with cables — who’ve chosen to share their files. To browse the files shared by another person within the Homegroup, double-click that person’s name from the Homegroup window. The window promptly displays that person’s shared folders, as shown here, ready to be browsed as if they were your own. Click a person’s name to see her shared files. Opening: To open a file on a shared folder, double-click its icon, just as you would any other file. The appropriate program opens it. If you see an error message, the sharing person created the file using a program you don’t own. Your solution? Buy or download the program from the Internet or ask the person to save the file in a format that one of your programs can open. Copying: To copy a file from one person’s Homegroup, drag it into your own folder: Point at the file you want and, while holding down the mouse button, point at your own folder. Let go of the mouse button, and Windows copies the file into your folder. Alternatively, right-click the file’s icon and choose Copy from the pop-up menu; then right-click inside the destination folder and choose Paste from the pop-up menu. Deleting or changing: You can’t delete or change the items in another person’s Homegroup folder. If you need to change something, copy it to your own computer’s folder and then make your changes on that copy. 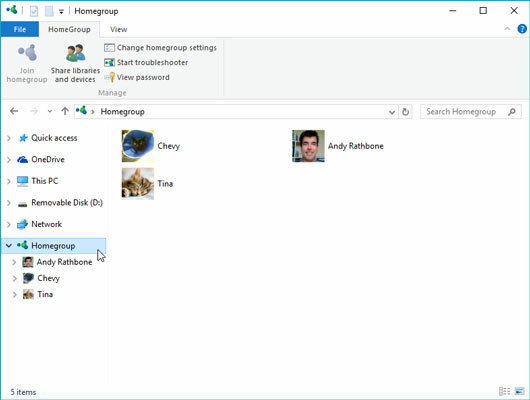 Homegroups simplify sharing files among computers, but Homegroups work only with PCs and tablets running Windows 7 and Windows 8 (or 8.1), unfortunately.